Wapakoneta’s Torie Carter keeps the ball away from Elida’s during Thursday night’s Western Buckeye League match in Wapakoneta. Wapakoneta’s Nicole Richard and Elida’s Cienna Kuhn battle for control of the ball during Thursday night’s Western Buckeye League match in Wapakoneta. Wapakoneta’s Ellie Settlage tries to keep Elida’s Cienna Kuhn from getting to the ball during Thursday night’s Western Buckeye League match in Wapakoneta. 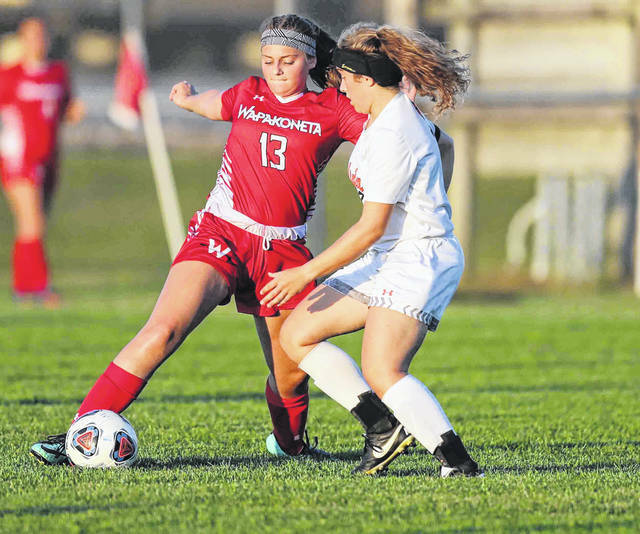 WAPAKONETA — Wapakoneta was taking squatter’s rights of the midfield. And the Redskins’ defense often looked like a 10-foot wall in front of the goalkeeper. That made it challenging for Elida to put together an offensive attack. 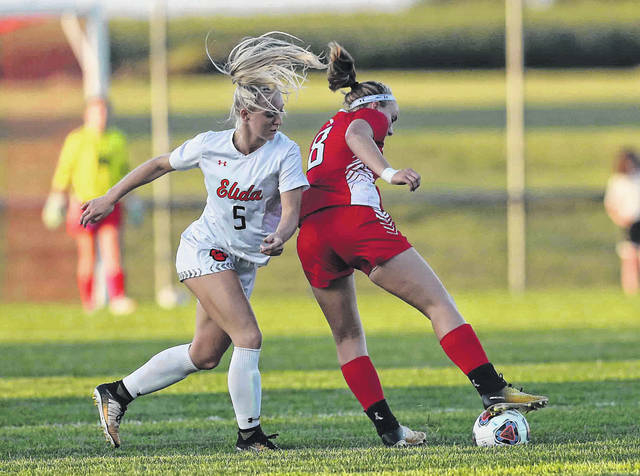 Wapak played a complete game, front to back, to post a 3-0 girls soccer victory over Elida on Thursday night at Ryan Field. Unlike Wapak’s loss to Shawnee on Sept. 4, the Redskins jumped down on the gas pedal early and never let up. The Redskins scored in the first four minutes and led 3-0 at the half. Ellie Settlage, Emily Ruppert and Ali Ruppert scored for Wapak. Wapak is 6-2-1 (3-1 Western Buckeye League). Elida is 4-1-1 (2-1-1 WBL). Wapakoneta goalkeeper Corrine Rainey had four saves for the shutout. Elida goalkeeper Erika Suever made three saves. Leading the Wapakoneta flat-back four defense was its center defenders Carter and Kentner. Both kept Elida forward Jency Jenkins (six goals) off the scoreboard. “We were trying to keep them pushed out of the 18 (yard box) and try to get them no shots on goal. And we were trying to not give up any through balls to the middle,” Kentner said. “I think we did a really good job of doing that. I’m really proud of our defense. Elida is a really good team. Foor said he also had defensive midfielder Nicole Richard keeping an eye on Jenkins going through the midfield. Wapak had the corner-kick edge 5-1. Settlage scored first with 36:16 left in the first half. Morgan Follin played the ball into the box and Settlage and two Elida defenders battled for possession. Both teams traded possession for several seconds until Settlage got the ball under control and fired it into the net from 7-yards out. Emily Ruppert scored on a breakaway, as she dribbled into the box and drilled it into the lower-right corner of the net from 15-yards out. That made it 2-0 with 6:47 left in the first half. 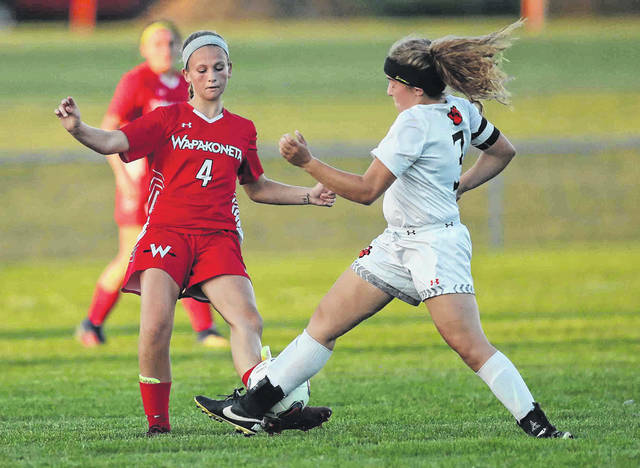 Wapak’s offense continued surging through the midfield. Madi Lause, just inside the box, played the ball ahead to Abbi Ruppert, who headed it in from 7-yards out. That pushed the Redskins’ lead to 3-0 with 3:16 left in the first half. The Wapak defense continually kept the Elida offense outside the 18-yard box until the final five minutes. Elida’s best chance of the night came when Jenkins’ shot banged off the crossbar with 2:37 to go. This entry was tagged Elida, Wapakoneta. Bookmark the permalink.